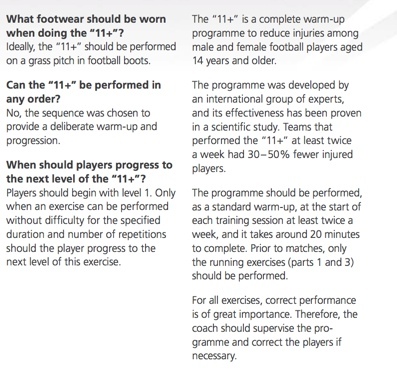 The FIFA 11+ was designed by a panel of experts from around the world. These people are experts in jury prevention, and they have come up with an easy-to-perform set of warm-up exercises that can literally half the amount of injuries that your team may suffer from. 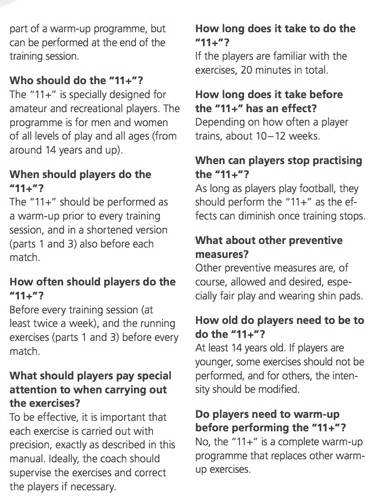 Research has shown that teams that have implemented The 11+ into their warm-up have reduced injuries by 35%, with more severe injuries reduced by 48%. Part 3: running exercises at moderate / high speed combined with planting / cutting movements. 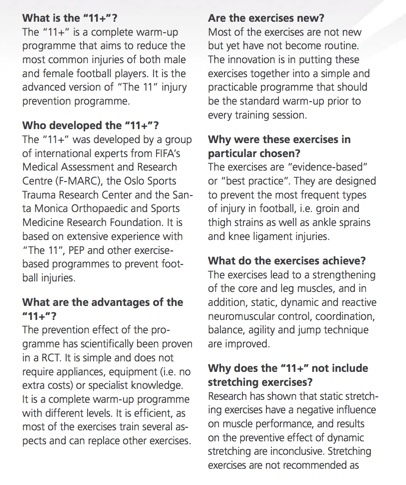 A key point in the programme is to use the proper technique during all of the exercises. pay full attention to correct posture and good body control, including straight leg alignment, knee-over-toe position and soft landings. Some drills provided courtesy of MKS for WSA. Please do not redistribute without permission.